Mix the flour and salt and place in a low oven for 5 minutes, then rub in the butter to form a breadcrumb consistency. Add the dried fruit and spices, mixing well and prepare the yeast mixture. Warm the milk with the sugar (microwave is fine) and add the yeast. Allow the yeast to bloom then pour over the dough base and combine using a butter knife to cut through the dough. Knead for 5 minutes, or until the dough comes together well and is soft and pliable. Leave in a large mixing bowl in a warm place, cover with a clean damp teatowel and allow the dough to rise for 45 minutes, it should double in size. Knead again, and divide into buns. 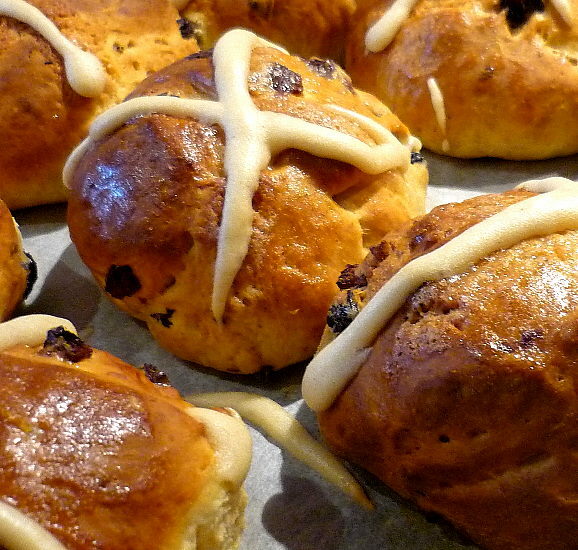 Place in a greased or lined high sided baking tray and form generous rows of buns, close together. 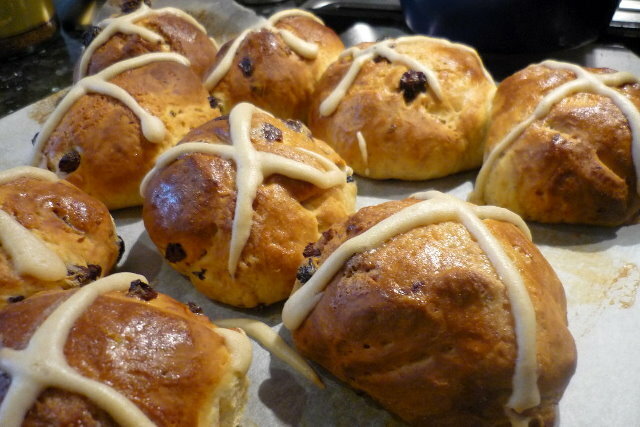 Add the crosses to the buns and allow to rise for a further 10 minutes. Mix ingredients into a thick doughy paste, form long thin sausages and lay over the buns in continuous lines to form crosses. Brush with milk. Bake in a hot oven for 15 minutes, until the tops are golden brown and the centres light and fluffy. What recipes would you like to see more of at thecookingbug.com? Powered by Drupal © the cooking bug 2011. All rights reserved.